We are honoRED that one of the youngest members of the RED family was inspiRED by our new RED PACK™ Program. 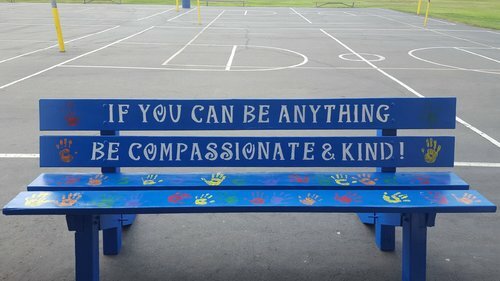 Unbeknownst to the President and Founder, Carmela Roth, her daughter brought the idea of a “Buddy Bench” to her new school, where she was entering 4th grade. Entering school in kindergarten is hard enough. To start school when all the children have been together for four years is daunting. The project was immediately embraced by the administration and her excited classmates. The project was completed in record time by parent volunteers and the 4th graders. This past Monday, the class did an incREDible job presenting their Buddy Bench to the entire school and performed a skit to demonstrate its purpose and importance. The bench proudly sits on the black top with a perfect view of the playground. It invites a child to sit and wait for a friend to approach them and encourages students that are already playing to ask a child sitting on the bench to join them. It is a friendly reminder that every day provides an opportunity to be compassionate and kind. Kindness matters and it is contagious!